We define technology in broad terms as 'the application of science for the improvement of our lifestyle, both historical as well as cutting edge'. As a group we meet once a month when a member gives a presentation of a subject of their choice followed by a discussion of the topic. The next meeting will be on Thursday, May 23rd at Mike and Paula's house in Newtown. Norman will give us a longer talk in Variable Speed Drives and then the usual 10 minute presentation will be the format. 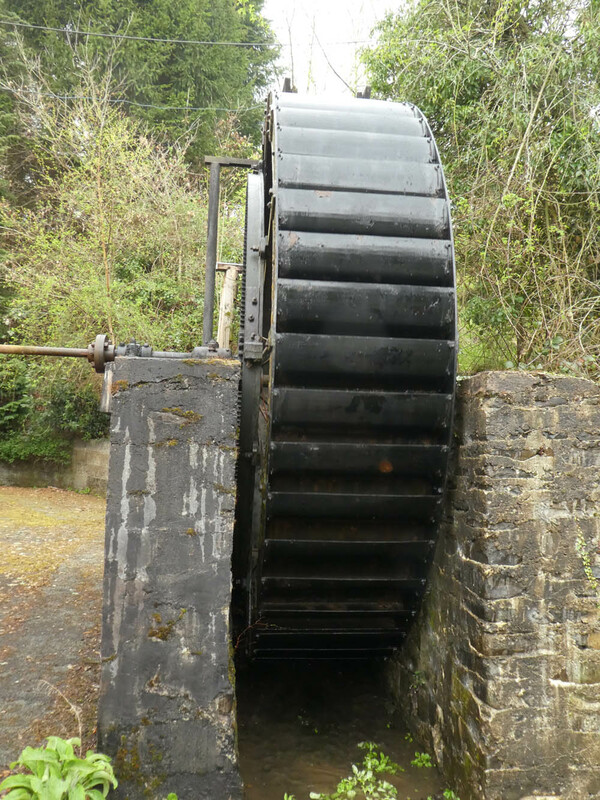 The April meeting was a fascinating visit to Tim's in Pontolgach to see the working water mill which still provides power to the original wheelrights/carpenters workshop. 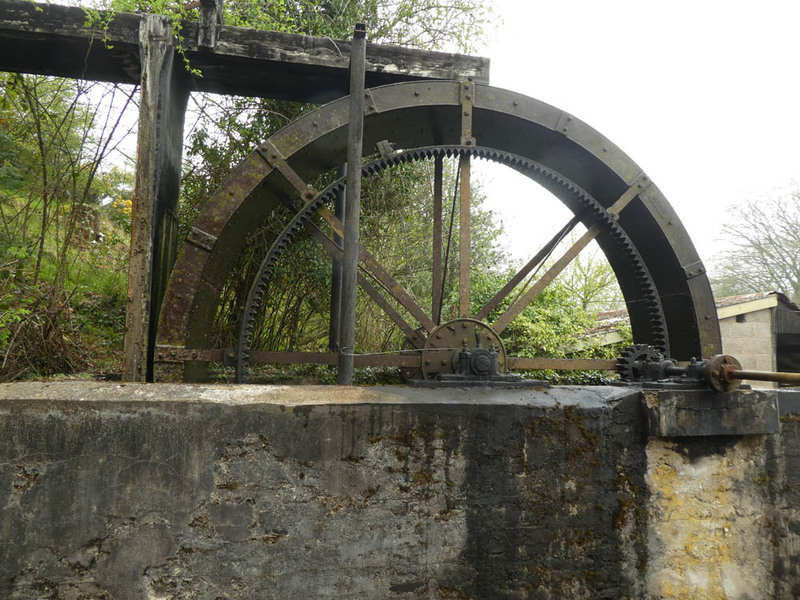 Tim demonstrated how the mill works and showed us around all the original features of the house, workshop and mill. He also showed us a hand made copy of an early motor car that he bought from the maker. It looks lovely but is not easy to drive without power steering or syncromesh gearing. Tim's enthusiasm was infectious and we all got a great deal of pleasure from the visit. The rest of the meeting was taken up with a presentation Nick on the amazing migration of the Painted Lady butterfly from Britain to the Saharah and the return by their offspring by a different route. Tony talked about the development of planes and space craft, highlighting the problems that have been encountered. He left us with the question of whether we think driverless cars should be controlled by computer or by drivers with computer back up. Finally Paula gave us a summary of the gender gap in Science and Technology where women are disadvantaged from the beginning to the end of their career. This provoked a lively discussion, split largely along gender lines. Freshly made refreshments were provided by Sheena. The March meeting at Alan's started with an introduction to new member Norman Simmonds who gave us a brief summary of his working background. Starting as an electrician he eventually became involved in control technology living in the US for some years and travelling worldwide. The first talk was byAlan on the cheery subject of smallpox which has officially been eradicated . The last death was of a medical worker who was exposed in a medical lab in Birmingham. This medical technician was a friend of Sheila who was working in the same lab at the time. Tony told us about the possible dangers of theft of keyless cars and recommended that anyone with such vehicles keep their keys in a Faraday box. He also talked about other innovations coming such as automatic speed control. Paula talked about the 5G mobile phone system which is being developed. It has a number of advantage, such as speed, but will need more low level transmitters and won't be able to penetrate walls. Nick told us about the techniques being developed or tested to deal with drones flying near airports. The most promising one he menioned was a defending drone fitted with a capture net. No agreed answer has yet been found so while many airports have banned drones enforcement is a problem. Mike talked about black boxes on aircraft, topical given recent crashes. They are now greatly improved and can monitor many more factors on an aircraft and analog recording is now used to replace the original tape recording. While they are not indestuctible they can withstand severe exposure to pressure, impact and heat. The meeting finished with each member giving a short summary of their working backgrounds for the benefit of the new member but also as a useful reminder to the rest of the group. The February meeting was at Ralph's house and was very well attended. We only managed to cover three topics though, since each provoked lots of discussion. First was Tim who told us fascinating things about clocks and clockmaking illustrated with a reproduction 16th C lantern clock. Mike then went through a report from Policy Horizons Canada which described developments in energy technology in the categories of storage, smart grid and generation. Paula finished with a report on the way we are all being manipulated by social media and the difficulties of detecting fake news. Ralph served the excellent scones, thoughtfully pre-buttered for us. All together a pleasant and enlightening morning. Five of us made it through the mist in Novermber to visit the River Simple factory in Llandrindod Wells and had a very instructive visit to he works and office of this innovative company. For ten years, they have been designing and building concept cars driven by Hydrogen fuel cells and we were guided by very enthusiastic managers who talked about the future of the hydrogen economy with its zero pollution .The car they have working at the moment can travel at 60 mph and 300 miles on a tank full of hydrogen. Unfortunately the limitation is fueling points which are nowhere close to us in mid-Wales. Their intention is to lease out cars, rather than sell them. Monmouth county council is setting up to have them as pool cars. We need to get behind the idea of a hydrogen economy and firstly get some fueling point. In October we met at Tony's house in Van. Tony started the meeting by talking about hydrogen fuel cells in connection with transport. The Hydrogen Council has an aim to get transport decarbonised by 2030 and a number of companies are actively looking at hydrogen fuel cell cars, including the local company River Simple, due to be visited by the group next month. Paula talked about the energy requirements of some of today's technology, particluarly artificial intellingence devices and computers. Computers use an estimated 5% of generated power world-wide. Mike talked about global warming and the UK government's plan to hold a Green GB week to celebrate the UK's achievements in tackling global warming. But, while CO2 emissions are falling in the UK emissions from transport have increased by 4% since people are buying bigger cars since the fuel duty incentive for low pollution hybrids has been removed. The plan for zero carbon homes has been scrapped and home insulation and solar panel grants have also been removed. The government is still also supporting expansion of Heathrow. It seems likely that the global warming target of 1.5 or 2C will now be missed and a new target of 3C is likely. At this increase in temperature many areas of the world will flood and many millions of people will have to relocate. Nick talked about the vast sums of money being spent in London, particularly on the new London Bridge station. The group agreed that the money spent in London should be more evenly spent across the country. Ralph talked about the new Hong Kong to Macau bridge, the longest in the world. Part of this road traffic route is a sub sea tunnel to allow shipping to enter the Pearl River delta. The driving time will be only half an hour. The September meeting in Newtown followed the usual short presentation format. It started with Alan giving us some startling facts about livestock farming for meat and the adverse effect this can have on the environment and availability of land for other crops. Some land, of course, is best suited to sheep farming but the general point is that meat eating will have to be drastically reduced in the future. Ralph told us about the amazing role played by carbon in life and it's formation by fusion reactions with hydrogen in the stars. Without carbon and oxygen, life would not exist. Mike talked about the progress that has been made in harnessing fusion reactions on earth for power. There are still many obstacles to be overcome but many countries have shown the feasibility of producing electricity from fusion of deuterium and tritium, largely brought about by improvements in magnet materials. Tony warned of the potential dangers of smart tvs. These are the only type of tv that will be available soon and although the multiple suppliers all have different technology they all will be able to access more information about the user than the current internet. July was a visit to the Spaceguard Centre in Knighton which is also the National Near Earth Objects Information Centre. This facility monitors asteroids and meteors and liaises with many other cetres around the world doing similar work. The facility was impressive and includes a telescope that was moved from Cambridge because of light pollution. The presentation was excellent and the presenter was knowledgable and informative. http://www.ukradon.org/information/ukmaps, how to order a home domestic test pack (currently costs £50.40) http://www.ukradon.org/services/orderdomestic, what to do if you have high levels of radon http://www.ukradon.org/information/tree-remedialwork and medical facts about the dangers of radon http://www.who.int/mediacentre/factsheets/fs291/en/. At the end of the meeting Neil gave us a photo quiz to identify 10 famous bridges worldwide. With the answers, Neil gave us a short history of each of the bridges. The highest score was 9 out of 10 by John. The April meeting was a train journey to Aberystwyth to view the Wallace Exhibition at the University. Alfred Russell Wallace has been called 'The Forgotten Evolutionist', a contempory of Darwen, Wallace travelled extensively studying nature and collecting specimens. He was from a humble background, born at Usk in 1823, with a life long passion for nature and scientific exploration. His paper was co-presented with that of Darwin to the Linnean Society but Wallace is now largely forgotten. This exhibition of his life showed his contribution to our understanding of how evolution works. A small but excellent summary of a very interesting life. We followed this visit with lunch in the excellent Median restaurant in Aberystwyth. The well attended March meeting started with a very informative presentation by Tony about OBD, On Board Diagnostics, for cars. Cars since about 2000 have connectors to take these devices which are cheap, available and can readily diagnose car problems. One supplier is Gendan. Mike then talked about building high rise wooden buildings, the latest one under construction in Norway is 81 m high. Mike also talked about developments in making 3D printed stainless steel components that are strong and ductile. Ralph talked about the wonderful human body and how well designed it is bu the use of multi-tasking organs. He also talked about the large, very versatile nose of the Sperm Whale. Neil described asteroids, where they are, what they are made of the possible danger they pose to the Earth. This was neatly followed on by John talking about the space probes to be sent to the sun to study the corona, solar winds and flares. We discussed the dangers solar flares pose to electrical and electronic equipment on Earth and the likely repercussions of a major event. The February meeting at Mike and Paula's was lively as usual. Nick started by showing us the geology map of the UK, downloadable from the British Geological Society. You can also download an app to check on local geology wherever you are in the UK. John then told us the history and technology behind the time signal (pips) transmitted by the BBC. This also included discussion about atomic clocks, GPS time and Big Bend. Paula then talked about two recent articles in the New Scientist. The first one was about the effect of 40 Hz noise on amaloid plaques in the brains of mice. It is thought that this frequency sound, and similar frequency light flashes, might help to prevent Alzheimers in humans. She also told us that there is a link between sleep deprivation and weight gain since lack of sleep can lead to increased craving for sugar. The January meeting at Nick's was well attended with 3 new members present. After introductions the meeting started with a talk by Nick on the 800th anniversary of the Institute of Civil Engineering. John then told us about Hyperloops, the proposed method of transporting people through tubes using mag lev suspension. The system is being discussed for transport between London airports and between Los Angeles and San Francisco. Mike followed with a talk on cancer statistics which are improving in the UK but early diagnosis is still not as good as in many other countries. Tony reported on the announcement that Iceland are planning to phase out plastic packaging in the next few years. Powys County Council have recently stopped recycling plastic film which now goes to landfill which Tony thought was a good solution. Some of the group disagreed. Tony suggested that U3A could act as an independent voice on the subject. The November meeting at Alan's house went well. There were presentations by John S on nuclear power plants and the development of small scale plants using waste plutonium chloride; Alan talked about Artificial Intelligence and the prospects of an age of robots and the use of 3D printers to make concrete structures; Mike told the meeting about the first large scale tidal energy system being installed in Scotland; Nick told us about the lack of UK produced components in the new bridge over the Mersey and the collection and treatment of sewage from around London in a major engineering project following the Thames. It was agreed that the next meeting will also be on a Tuesday and future meetings may revert to the Thursday. The September meeting at Nick's was very well attended with some lively discussions. Mike started the meeting with some information on 2 new developments to harness solar power. The first was a way to collect energy in a chemical molecule in a reaction that can be reversed. The second was a room temperature process to convert biomass into hydrogen with a by product of calcium carbonate. Paula gave an interesting talk on computer on line protection (see below). Alan told us about some recent research that cast some doubts on the method of calculating temperature rise from historic data. The conclusion was that the limit of 1.5 degree rise is achievable but with great difficulty. John reported some recent data about the cost of electricity being reduced from offshore wind being reduced over recent years down to £57.50/mWh, making it now competitive with nuclear power. Learn to spot spam and scams. Be aware all the time. Change your birthday on all web sites that ask for it. Make yourself younger so you aren’t a target. Turn your computer off every night. Unplug it every so often as well. Backup regularly and frequently. You can use software for this. Onlines guides will help. Turn off Tracking cookies Microsoft Edge, Firefox and Chrome users can adjust their preferences to say they would prefer not to be tracked. Consider also installing a browser extension such as Ghostery to block all trackers. Be more Antisocial While you cannot control the servers used by your favorite social networking websites, consider carefully what you post online and make sure to familiarise yourself with the privacy settings of your favorite social network. Facebook users can benefit from TechRadar’s recently updated article on Advanced Facebook privacy and security tips. The first rule about keeping yourself protected online is to make sure you have difficult-to-guess passwords, which ideally will be unique for every website that you log in to. Password managers remember passwords for them, and those can also be used to create unique, hard-to-crack passwords to boost security." These password managers - such as KeePass - store all of your passwords in an encrypted digital vault that you can access with one master password. The vault can be stored on your computer or on a removable drive like a USB stick so you control your data. When you click on an entry you can automatically copy passwords to clipboard and paste them into the password box on the site. The most popular version of this involves you providing your password, along with a verification code that's sent to your smartphone. Other methods include PIN codes generated by a physical device. On an iPhone, open settings, hit Touch ID & Passcode, flick on Erase Data, and click Change Passcode to set it to a six-digit PIN. Almost every Android is different, but look for a “security” menu in the settings app, sometimes under “personal”. Then, head to the “lock screen” menu to enable the auto-erase feature. Save your data on a different drive from C: Most virus attacks target C drive so saving your data (as opposed to the programmes themselves) will help protect you. This can be a second drive in your computer or your one partitioned hard drive. The August meeting was a train trip to Birmingham to visit the Science Museum, now known as the Thinktank. This is a very impressive place with an apparent emphasis on getting children involved in science and technology. Some of the space exhibits, particularly the large moon, were excellent. Most of the team finished with a pub lunch and a visit to a Asian supermarket. A good day out in spite of overcrowded trains. During a visit to Scotland Alan came across a replica of the first pedal bike. The original was made in 1840 by Kirkpatrick Macmillan, a blacksmith’s son who lived in the hills north of Dumfries. The replica is at Drumlanrig Castle, not far from Macmillan’s home. The bike was driven by rods linked to pedals and cranks at the rear. The wheels were basically cartwheels and the front one was steerable. Macmillan once rode it all the way to Glasgow. It was a great invention by a lowly figure in a remote area. Chain-driven bikes came several years later. Alan took the following photo of this bike. At the June meeting at John's house, Mike gave an overview of stainless steels, what they are and where they are used. The meeting in May at Mike and Paula's was the usual mix of short contributions. Alen told us about the history of the Cutty Sark and of a recent visit he had paid to it in London. He recommended taking a boat from central London which included the Cutty Sark and the Greenwich Observatory. Paula has been considering changing her Yaris car for an Hybrid. She explained the technology, economics and availabillity. Her conclusion is not to buy one at this stage of development. John talked about the fascinating subject of gravity that has been known about for centuries but still not understood. Nick told us that we are all walking inefficiently by putting our heel down first rather than the ball of the foot. There is apparently an electrical device that can help improve your walking efficiency. Ralph told us of a recent article about the Gaia campaigner, James Lovelock, and of the interesting books he has written. We have missed a few meetings and at others notes have not been taken, but the April meeting was at Nick's. This meeting started with Nick giving a slide presentation outlining the building of the Clywedog Dam 50 years ago. Nick was a young engineer on this major project and his collection of slides gave a good overview of the construction techniques used. Many questions and discussion points were raised during this presentation. John then talked to us about the technology used in rails, with illustrations of the main components. Mike had a relevant topic which was to do with recycled polymer composites, which are being used for marine structures but also to replace creosote treated softwood railway sleepers. There are also bio-based polymers now being used to make PET soft drink bottles by Coca Cola and others. The October meeting at Ralph's started with Ralph telling us about the physiology of sprinting, illustrated by the 100m sprint. Nick talked about immunotherapy for cancer treatment and the various approaches under development.. Neal told us about Downs Syndrome and the recently developed blood test to detect the likelihood of a fetus being born with it. This raised the moral dilemma of whether abortion is a suitable response to this information. Mike talked about a number of technology news items including the largest offshore wind turbines being installed in Liverpool Bay; the use of coffee infused filters to remove lead and mercury from contaminated water; the use of microwaves to remove graphene oxide from graphene; development of a flexible solar cell material capable of being put on a roll; and a Japanese energy independent sludge incinerator. Finally, Paula told us about modern theories that have disproved the long held theory of the Selfish Gene. It was a small but very lively meeting. The September meeting followed the regular format of 10 minute topics from each member. Mike started with a description of the current state of plastics recycling and some of the exciting prospects for the future; Neil described the recent hacking by Russians of medical records of athletes and the permitted use of banned drugs for stated medical conditions; Nick talked about the items on metaphysics in a recent edition of the New Scientist; followed by Paula discussing medical reversals in which perceived treatments are found later to be ineffective; John gave us a detailed talk on the switch from analogue tv to digital tv in the UK which led on to a general discussion on the current technology and available hardware for watching and recording tv.. The August meeting covered a range of topics. Nick told us about research that is ongoing to limit the effect of earthquakes on buildings, most of the techniques have some degree of effect but would be expensive and are not yet practically applicable. Mike talked about plastics recycling and the poor success rate currently but the Kyoto Institute of Technology has identified a new bacterium that can use PET as its main source of nutrient. Ralph described the recent around the world flight of the Solar Impulse, an entirely solar driven plane. Alan told us all about ticks, the dangers they pose to walkers and the safe way to remove them. Neal gave us an interesting summary of the design and building of the Sydney Harbour Bridge which broke many records when it was built in the '30's. Paula compared the sort of information that you can get by DNA testing by Ancestry and 23and me, the 2 main companies offering this test. 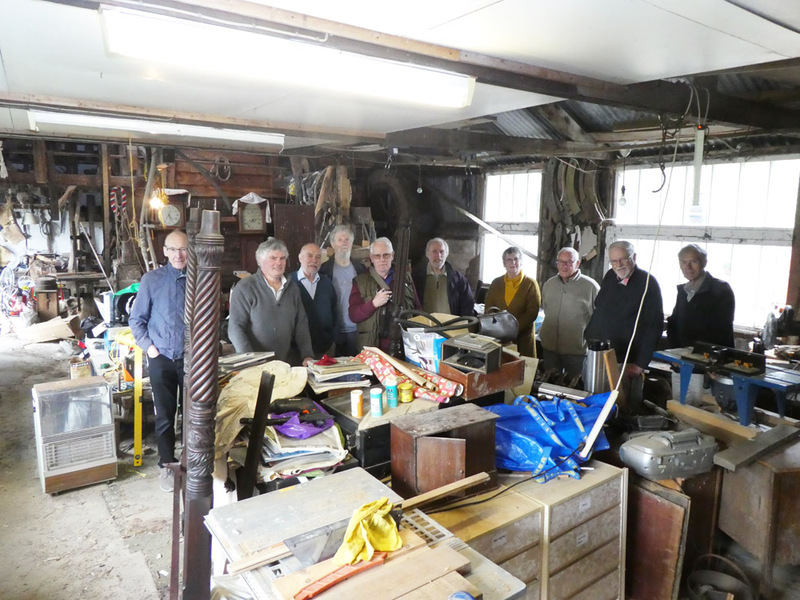 The June meeting at Neil's house followed the 10 min format and covered the diverse topics of San Fransisco street cars; Sigmund Freud; the Gotthard Base Tunnel; Cold Economy; sleep; polls for the EU Referendum; and super lenses for optical microscopy. 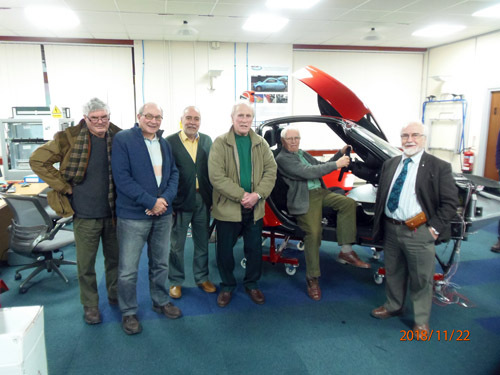 The April and May meetings both took the now familiar format of members making 10 minute presentations on various topics as a basis for general discussion. The March meeting took a different approach. We decided to have a general discussion about the EU and whether the UK should stay in or leave in the forthcoming referendum. It was a very lively meeting which included a couple of interested guests. The majority of those present favoured staying in with well founded arguments based on many factors including economics, scientific research and history. The February meeting at Nick's started with Alan giving us some very interesting information about Tata, their history and current position in the UK. Paula talked us through the potential pit falls of social networking and data gleaned from the web. Neil then told us about the construction of the Brittania Bridge over the Menai Straits and the problems encountered. The November meeting at Alan's house was the usual 10 minute topic that engendered many diverse discussions, both technological and political. John started by describing the pilot plant built by RWE to capture CO2 from the Aberthaw coal fired power station. It is very energy hungry and produces large amounts of CO2 that have to be disposed of. Mike talked about various lists of technological breakthroughs of the past and those predicted for the future. Nick described how the travel of earthquake waves through the earth have been used to determine the size of the core. Alan told us about the various materials that go into making the bags used in tea bags. Some of these are potentially carcinogenic and the group agreed that loose tea gives a better cup anyway. Finally Paula raised the topic of the so-called Snoopers Charter that the UK plan to bring in. It was agreed that it will be very expensive, ineffective and in contravention of individual rights, but will probably be implemented anyway. The September meeting was held at Nick's house with a smaller than usual group. The 10 minute topics were started by Nick who talked about Clair Patterson, a researcher who correctly estimated the age of the earth at 4.5 billion years, based on a study of meterorites. Paula then told us about the shortage of rare earth elements and the surpising facts of their widespread use in smart phones and other devices. Mike told the group about bomb proof linings for aircraft holds; 3D printed unmanned aerial vehicles; development of materials with high melting points; and black phosphorus as a possible replacement for silicon. Ralph completed the session by describing the use of 3D printing to produce medical pills that are easier to swallow, can carry higher doses of active ingredients, and can be tailored to individual patient's needs. The July meeting was a return trip to Ironbridge. The group shared cars and visited the Iron Museum, Enginuity, a local pub for lunch, the Tar Tunnel and the Coalport China Museum. See the image of some of us in the Tar Tunnel. It was a hectic but very pleasant day and the weather was a lot better that during our previous visit.